You can increase your productivity and unchain yourself from your computer by using iPad apps. 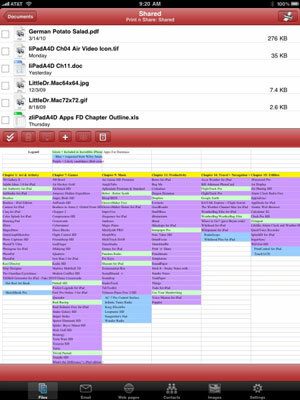 Consider these apps for organization, sharing, printing, and note-taking. 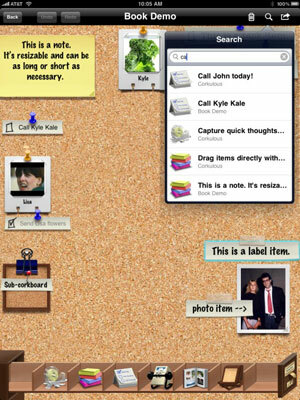 The App Store description of Corkulous calls it an idea board that provides a way to collect, organize, and share your ideas. As you might expect from its moniker, Corkulous uses a corkboard as its metaphor. You start with a single corkboard but can then create as many additional corkboards as you want. Dropbox is, in a nutshell, software that synchs your files online and across your computers. You can use it to synchronize files among as many Mac, Windows, or Linux computers as you want. 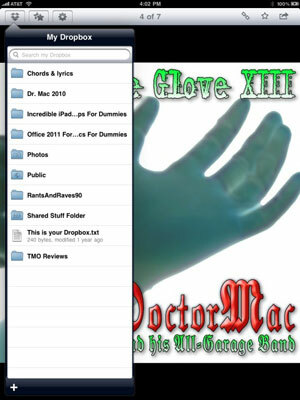 You can use it to share files with anyone you want. And you can use it to back up important documents. You first create a free Dropbox account and install the free Dropbox software on your computers (let’s call them Computer 1 and Computer 2). A folder named Dropbox appears on each computer; all files you put in the Dropbox folder on Computer 1 are instantly available in the Dropbox folder on Computer 2, and vice versa. Plus, because Dropbox stores those files (2GB free) on its own secure servers, you can access them from anywhere with any Web browser. With the Dropbox iPad app, you can use the Internet connection on your iPad to view the files in your computer’s Dropbox folder. 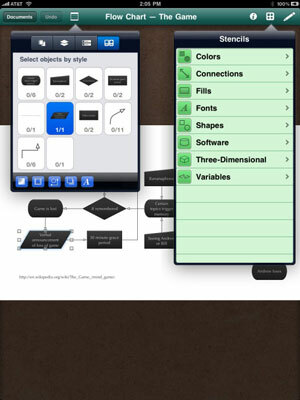 OmniGraffle for the iPad allows you to create flow-charts and mind maps. One of the best features of OmniGraffle is the way it uses Stencils — collections of pre-made shapes, images, and connectors — to use in your documents. Select an object or multiple objects according to their style. Change the stacking order of objects. Create and manage multiple canvases in the same document. If you ever have to print documents on your Mac or PC — whether locally over your Wi-Fi network or remotely over 3G or EDGE — Print n Share is what you need. The app understands lots of common file types, including .doc, .docx, .xls, .xlsx, .txt, .html, PDF, Pages, Numbers, and so on. Print n Share includes a built-in Wi-Fi solid-state drive that lets you drag and drop files between your iPad and your computer, so you don’t have to waste time connecting via USB and performing a sync. Print n Share also has a full-featured e-mail client built in; you can send and receive mail, print messages and enclosures, and save messages and enclosures as files on your iPad. It also includes a built-in Web browser so you can print, save, or e-mail Web pages and import bookmarks from your Mac or PC. 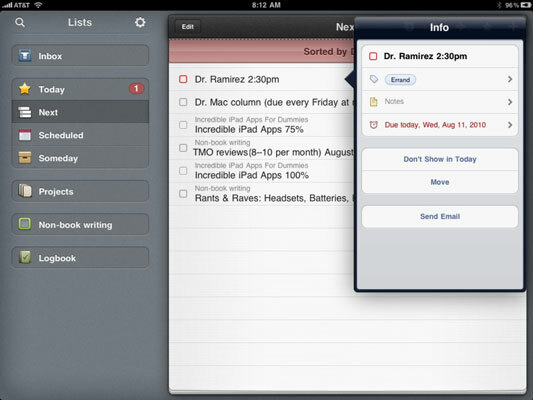 Unlike some other task-management apps, Things for the iPad is easy to set up and use. Things easily adapts to your personl style. Some apps force most or all of their methodologies on you, and in the process make it more difficult to use the app the way you want. Things’s user interface is remarkable — it’s simple, clean, and uncluttered. Although you can use the Mac version of Things in tandem with the iPad version, if you’re using a Windows PC, there’s no Windows version of Things. Wouldn’t it be nice if, instead of having to type text or e-mail messages, you could dictate them and have your spoken words magically translated into text? If that sounds good to you, you’ll love Dragon Dictation. Just tap the big red Tap and Dictate button and speak into your iPad’s microphone. Tap anywhere on the screen when you’re done talking and in a few seconds, the words you just spoke appear onscreen as text. GoodReader is one of those apps you won’t know you need until you actually need it. Its specialty is letting you read the huge PDF or text files that bring other iPad apps to their knees. It’s also one of the best apps for reading just about anything — including Microsoft Word, PowerPoint, and Excel files; iWork’08 and ’09 files; Web pages and Safari webarchive files; plus a number of high-resolution-image file formats. Instapaper is an iPad app that lets you save Web pages from any browser and read them later on your iPad, with or without an Internet connection. And give the tilt-to-scroll option a chance. It takes some getting used to, but it allows you to scroll down the electronic page easily. SoundNote lets you record audio while you type notes — and the notes are then synchronized with the recording. So, for example, if Steve Jobs says, “We’ve sold three million iPads in the first 80 days,” you can type something like, “3 mil in 80 days.” When you review your notes later, just click next to the words, “3 mil in 80 days” and listen to the audio from that particular portion of the speech. Yes, Use Your Handwriting is yet another to-do list organizer/reminder type app, but it has a unique twist: You can’t type notes or even speak them. Instead, as the app’s name implies, when you use Use Your Handwriting, you write your notes by hand (actually by finger). The screen scrolls automatically to allow you to write entire sentences on one line.